The Farrelly brothers are the kings of dumb comedy, creating two of the stupidest movies of the '90s in Dumb and Dumber and There's Something About Mary. Their latest offering, Stuck on You, the tale of a pair of conjoined twins, Bo (Matt Damon) and Walt (Greg Kinnear), that move to Los Angeles so Walt can pursue his acting dreams, falls short of the idiotic but hilarious heights reached by the two aforementioned movies. This is because they each had something Stuck on You does not: talented comedic actors like Jim Carrey and Ben Stiller. While both of the film's stars are talented actors, comedic geniuses they are not. 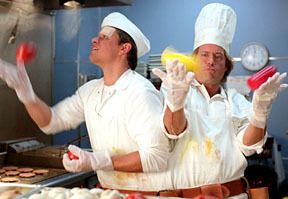 This tempers the comedy of Stuck on You and causes the film to drive more towards the dramatic (for the Farrellys), as the two brothers attempt to cope with the troubles that success brings. That's not to say that the movie is serious in any way, but the small elements of emotion temper the comedy and you find yourself caring about the characters. The strongest moments of the film come before the twin's trip to California, where they interact with the other inhabitants of their small town in Martha's Vineyard, and in the repeated flashbacks of the twin's playing football or playing as children. Damon and Kinnear's acting skills also prove to be an asset when Walt, the outgoing twin, repeatedly draws the two into embarrassing situations where Bo's discomfort in painfully obvious.